Venus - Gorgeous goddess gold Swarovski crystal evening purse - SALE!!! 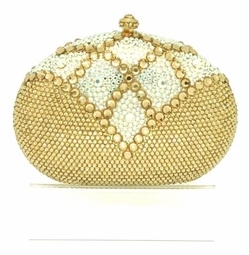 HOME / WEDDING ACCESSORIES / Crystal Evening Purses / Venus - Gorgeous goddess gold Swarovski crystal evening purse - SALE!!! Goddess look, a mix of light and dark gold Swarovski crystals in an amazing design. Chain strap included along with extra crystals and an elegant storage box. Measures approximately 5" long x 3 high x 1" wide.